Behind the scenes with David McCullough ’18Hon. Historian and author David McCullough ’18Hon. at the One Hundredth Commencement Exercises of Providence College. Alexander Hamilton has an award-winning Broadway musical, but historian David McCullough ’18Hon. remains loyal to Hamilton’s rival, John Adams. The conflict between the two Founding Fathers was documented in John Adams, the book by McCullough that won the Pulitzer Prize for biography in 2002, was adapted into a TV miniseries, and like the rest of McCullough’s books, has never been out of print. 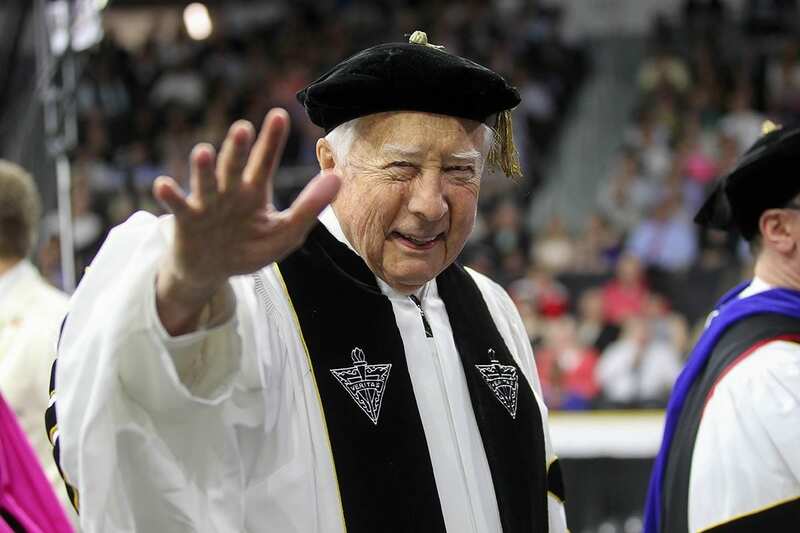 McCullough was asked about the rivalry, and about Hamilton the musical, during an interview prior to the One Hundredth Commencement Exercises of Providence College on Sunday, May 20, during which he received an honorary doctor of letters degree and presented the keynote address. “Anybody who isn’t a friend of my friend John Adams has an uphill climb,” McCullough said. One year ago, McCullough helped dedicate the new Museum of the American Revolution in Philadelphia. Talented students from the Philadelphia High School for Creative and Performing Arts joined an original Hamilton cast member, Sydney James Harcourt, in performing songs from the musical. But he hasn’t seen it yet, joking that he is descended from a “number of Scots, and we don’t like to pay that much money,” and adding that the show is taking place in New York, far from his home in Hingham, Mass. In fact, McCullough is busy on his next book, The Pioneers, the story of New Englanders who went to Ohio to establish the first town in the Northwest Territory. They were veterans of the Revolutionary War who’d been paid in worthless money and were offered land as compensation. They overcame challenges to establish a territory with public schools, constitutional government, and — rare for that time — no slavery. “I like taking people you’ve never heard of and giving them long overdue credit,” McCullough said. He begins writing his books before his research is complete. “Enough to get started,” he said. “It helps me figure out what additional information I need. And, I need to know how much I don’t know yet. 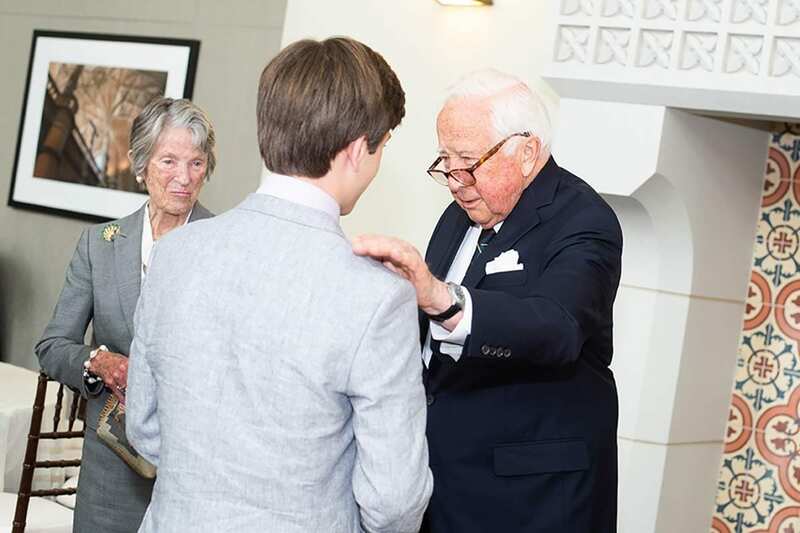 Sam Rachleff of Houston, Texas, talks with David McCullough ’18Hon. during the president’s reception at the Ruane Center for the Humanities. He is the son of honorary degree recipient Larry Rachleff ’18, retired music director of the Rhode Island Philharmonic and Orchestra and a professor at Rice University. When he has time, McCullough reads fiction, not history. He loves Anthony Trollope and mystery writers such as P.D. James and Ruth Rendell. A gifted speaker and the holder of 55 honorary degrees, McCullough writes a new address for every event he attends. “I feel very strongly that if they’re honoring me that way, I must do something that’s done just for them,” he said. McCullough’s first appearance at PC came in 2013, when he spoke at the dedication of the Ruane Center for the Humanities. He will celebrate his 85th birthday in July. His wife of 63 years, Rosalee Barnes McCullough, whom he described as his editor-in-chief, accompanied him at commencement.